Texting apps are every bit essential to the present day smartphone experience. In many countries, where texting through SMS is expensive, apps like WhatsApp make things easier by keeping you connected with friends over the internet. But most online texting apps require you to share your phone number with people you want to talk to. That might not be great if you don’t want your phone number to be shared around too much, or if you don’t trust the person enough. Thankfully, not all apps need you to share your number. The number of these apps is lesser than ones that rely on phone numbers to connect users, but among this short number too, you can find some pretty amazing apps that are respected in the mainstream just as much as the rest, if not more. Check out our list of 5 Best texting apps that don’t need your phone number. There’s not many messaging services as popular as Facebook Messenger. Facebook’s membership of 1 billion, in addition to pages and group conversations, its messaging service is pretty populated. Using your phone number can certainly enhance your facebook account’s security, but it is in no way needed to connect with your favorite people, organisations celebrities. If they’re on Facebook, you can send them a message. To reduce spam, Facebook has recently introduced the concept of message requests where you need not be friends with someone to chat with them, nor do you have to deal with an inbox flooded with messages from people you aren’t already connected with. Send a first message as usual and once the person accept the request, you can chat with them freely. Chatting with people without sharing your phone number is sort of Kik’s USP. The app has been around for quite a while, and got a lot of bad press regarding security back in the day. Kik has since become even more rigorous in their security features and it is now among the safest apps around. It is easy to join to leave conversations on the app, and you don’t need to share your phone number with anyone at any stage for it. You can even login to Kik online (though not many know how; here’s a quick procedure), and chat with bots, play games with friends and in general have a good time. Also, the stickers and media sharing are amazing. For people who prefer a more nerdy touch, Discord is the perfect option. The app gives you thorough control over every facet of the conversations you have, most notably what you get notified about. 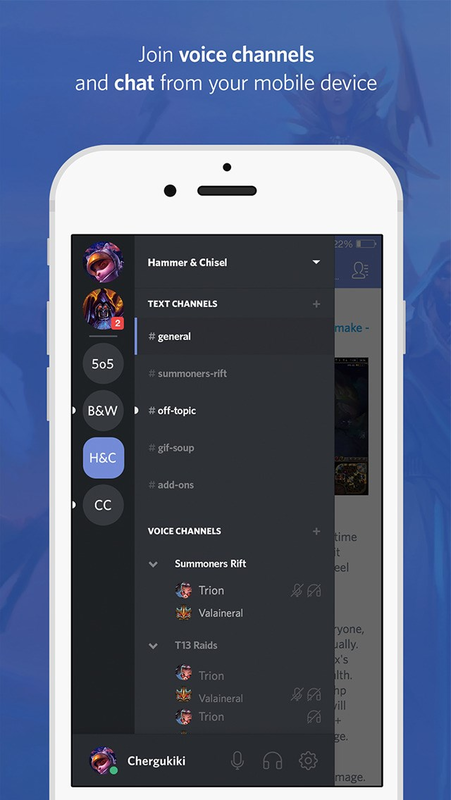 Discord is a chat service originally intended for gamers playing Worlds of Warcraft or Call of Duty or some other multiplayer game, and it has text as well as voice chatting, both also supported for groups as well as private conversations. Discord does not need you to share your pictures, phone number or any other details with the app, which makes it a lot more safe and secure for gaming purposes, as well as for other forums like Reddit which stress similar privacy culture. For people who prefer to use email accounts to keep in touch, Hangouts is a great texting app available for all mobile phone OS while also being accessible online. Being part of the whole Gmail package, it also has the professional touch associated with emailing, and so it can be a great way to keep in touch with business associates and clients, as well as hold video conferencing without having to share personal information like phone numbers or facebook profiles. Record of all hangouts is also seamlessly maintained in the email account itself. Google’s other star apps, Allo and Duo, are yet to get email integration and so they still rely on using phone numbers, unfortunately. But that should change soon, if rumours are to be believed. After all, Google does have a thing for long testing periods of even standard apps and updates. Skype ruled the video chatting roost, once upon a time. Then, the world shifted to smartphones from PCs and the program was forgotten, thanks to Facetime. Skype moved onto Android and iOS quietly, but it has not been noticed. Thankfully, for people looking to converse with people without having to share their phone numbers, Skype can prove useful. Skype lets you find people using their IDs on the app and connect with them just as easily. You can text, voice call as well as video call, and yet not have to worry about privacy risks associated with sharing phone numbers. The app has yet to catch up with the various features more mainstream apps offer, but it’s still pretty amazing. There are other apps you can use as well. There’s Blackberry Messenger (BBM) that was once very popular, or maybe Yahoo Messenger will be more to your taste. More apps are expected to join the no-phone-number club eventually. It’s just more convenient and secure. I’m surprised more people aren’t aware of Wire Messenger. They too don’t require your phone number. The app is Open Source, end-to-end encryption, privacy-respecting, do not track, collect data, share data. They have clients for Linux, Windows, Mac OS, Android, iOS. Even runs in a browser. I’ve been using it now for a while on both Linux/Mint (32-bit) and Android. I started using it directly as an old-school IM client (we don’t have many of these anymore) but decided to install on Android too (they don’t copy contacts without permission and can still use it w/o phone number). Texting, Video chat, Voice over IP, attachments, drawing over pictures… it’s got it all. You guys should look into them. Yes you are right! If you want to register using email address, try to register at app.wire.com using a desktop computer. Awesome. These apps could be very useful. The features you tell is very special for every user Because many users want to use texting application without providing their phone number. Here you hit the centre for that kind of people who need this very badly. Keep updating this kind of post. Most users prefers to use Skype over other texting apps because it’s very old, trusted and reliable. At least Skype and Discord can any day demand a phone number to be able to log in.